A Gallatin County jury found a Bozeman woman guilty of attempted murder Friday after she broke into a former tenant’s house and shot him twice following a legal dispute over the return of his security deposit. The jury deliberated for 15 hours over two days before returning its verdict against Diana Arnold, 59, The Bozeman Daily Chronicle reported. Arnold was charged with attempted deliberate homicide and aggravated burglary. Prosecutors argued she shot Henry “Dave” McDunn on May 30, 2012 — nine days after a judge ordered her to pay him about $22,000 in a dispute over the $1,300 security deposit. Arnold testified that she didn’t remember much from that day, but she said it was McDunn who attacked her and that she didn’t shoot anybody. The trial began with jury selection July 17. 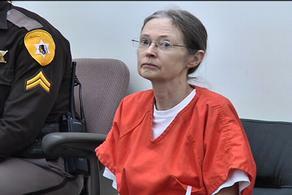 Jurors heard closing arguments Thursday before retiring to deliberate. Arnold’s sentencing is scheduled for Oct. 7. McDunn and his wife cried as the verdict was read. County Attorney Marty Lambert told jurors that Arnold drove to an area near McDunn’s house, broke in and ransacked the house, scattering crumpled newspaper and matches, and waited in disguise for McDunn to return home. Defense attorney Chuck Watson countered that Arnold suffered a brain injury in a 1999 car crash, was in a “dissociative state” on the day of the shooting and didn’t know where she was. Arnold acknowledged she owned many items found by investigators in McDunn’s house, including a .22-caliber revolver, two gallons of gasoline mixture, a hat with a wig sewn in it, and a pair of men’s shoes that she wore over her own, along with other items. She said those are items she uses when burning slash on her property, and she did not know how they or she got into the house. “It’s like when you wake up from a dream in the morning and all you remember are bits and pieces,” she said. McDunn testified he walked into his house and Arnold shot him in the back of the head, leading to a struggle during which he was shot a second time. “She shot me, she attempted to murder me,” McDunn said. She also said noticed her gun sitting on a washer or dryer nearby, but she didn’t recall how the gun got there. Both reached for it, she said, and it went off during a struggle. During her testimony, Arnold also described the effects of the brain injury caused when her car was rear-ended by a semi-trailer. She said she had hallucinations, a short temper, depression, anxiety, sleep loss, night terrors and memory lapses. But Lambert questioned Arnold’s “manufactured” inability to remember how she got into the house, while pointing out her apparently clear recall of the fight. Arnold has been jailed with bail set at $1 million since her arrest.